Getnewsupdate.info is the PUP that uses misleading techniques to prevent removal. Use Reimage to locate malicious components and get rid of them faster than with uninstall instructions. A full system scan blocks virus reappearance and prevents traffic to malicious domains. Getnewsupdate.info - adware which uses the pay-per-click marketing technique to gain income from advertising. 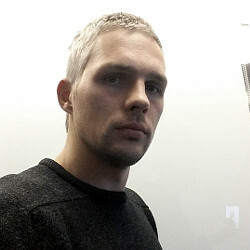 Getnewsupdate.info is adware which enters the computer system in the same way as other PUPs – through bundling. Once installed, this program starts modifying browser settings such as the homepage. Moreover, Getnewsupdate.info virus starts producing a huge amount of ads which later on might cause regular browser struggles. Nevertheless, one of the most annoying and sometimes dangerous activities that this adware can perform is redirecting. You might be taken to a website which promotes dubious content. If clicked, such content might result in a secret installation of some type of malware. Infected browsers are facing crash downs/slowdowns. Another valuable reason to perform the Getnewsupdate.info removal is this program's ability to collect non-personal details which relate to the user's browsing experience. Such data can be various sites visited, bookmarks saved, pages viewed, IP addresses and other content which developers can benefit from. Use Reimage to eliminate the PUP. 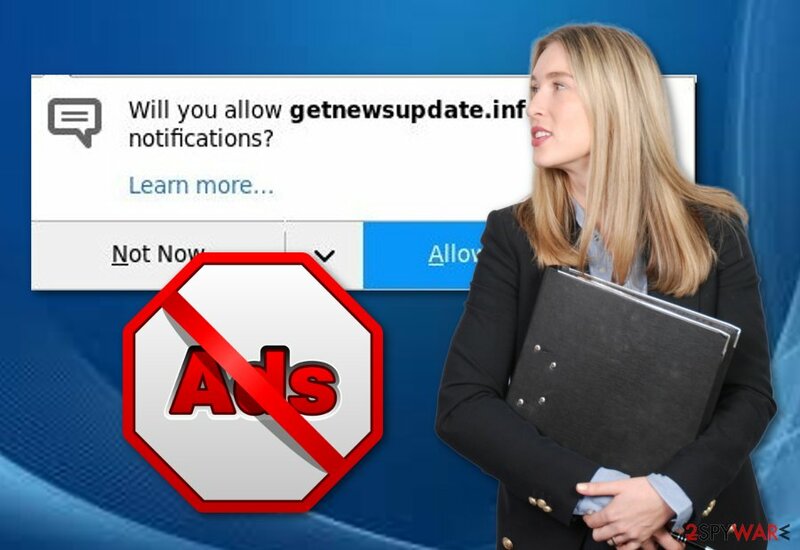 Getting rid of Getnewsupdate.info adware is necessary if wanting to avoid consequences such as harmful redirecting, browsing-related data collecting, overloading ads, browser modifications, web browser slowdowns, and so on. After you remove the potentially unwanted program, make sure you take some precautionary measures to avoid adware in the future. Getnewsupdate.info - adware which has an ability to collect browsing-activity related information. Rogue pages. There are many questionable pages throughout the Internet that might involve unwanted or even harmful components. Such pages often lack protection and might even relate in a secret installation of a malware form. If you ever overcome a suspicious-looking page be quick to exit it and never return. The safety of your computer is in your own hands. However, we recommend installing anti-malware software too. Security software will protect the PC system automatically and allow you to perform regular system scans to locate all threats possible. Note that you need to keep your antivirus program always up-to-date. You can perform the Getnewsupdate.info removal in two different ways. The first one is called manual and requires more of the user's effort. You will need to open your infected browsers such as Google Chrome, Mozilla Firefox, Microsoft Edge, or Internet Explorer, and get rid of all adware-added web browser extensions, plug-ins, add-ons, and apps. However, if you find this method difficult, you can always eliminate the PUP by using anti-malware software. 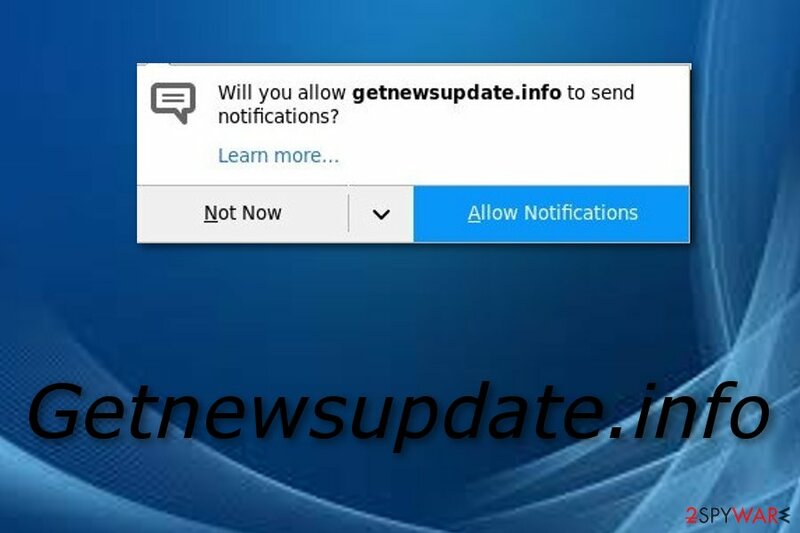 To remove Getnewsupdate.info virus automatically, you can use programs from our suggested list or any software that you are likely to download. However, make sure you pick a reliable program, otherwise, some adware-related components might be left. Moreover, after you complete the elimination in an automatical way, make sure you do not forget to perform one more step. Refresh your browsers that were affected by adware to ensure that they are good for usage again. Here, look for Getnewsupdate.info or any other recently installed suspicious programs. When in the new window, check Delete personal settings and select Reset again to complete Getnewsupdate.info removal. Once these steps are finished, Getnewsupdate.info should be removed from your Microsoft Edge browser. Here, select Getnewsupdate.info and other questionable plugins. Click Remove to delete these entries. Now you will see Reset Firefox to its default state message with Reset Firefox button. Click this button for several times and complete Getnewsupdate.info removal. Here, select Getnewsupdate.info and other malicious plugins and select trash icon to delete these entries. Click Reset to confirm this action and complete Getnewsupdate.info removal. Here, select Extensions and look for Getnewsupdate.info or other suspicious entries. Click on the Uninstall button to get rid each of them. Now you will see a detailed dialog window filled with reset options. All of those options are usually checked, but you can specify which of them you want to reset. Click the Reset button to complete Getnewsupdate.info removal process. ^ Adware. Techopedia. Computer encyclopedia and worldwide IT definitions. This entry was posted on 2018-09-26 at 06:09 and is filed under Adware, Viruses. You can quickly scan the QR code with your mobile device and have Getnewsupdate.info manual removal instructions right in your pocket. How did you remove Getnewsupdate.info?